Are you wondering how to clean your Maui Jim sunglasses? To keep your shades looking like new, be sure to follow the recommended instructions for cleaning and care. Maui Jim sunglasses require special care since they contain an anti-reflective, waterproof coating on the lenses. This coating is reduces glare and eye strain while repelling water or snow and what makes Maui Jim sunglasses so unique. In order to keep the lenses of the sunglasses free of scratches and looking like new, it is important to know how to clean them correctly. Maui Jim recommends regularly rinsing the lenses under warm water. This will remove any dust that has accumulated. Use a mild dishwashing soap to wash the surface of each lens, then rinse thoroughly. To dry the lens, use a soft cloth only. Most Maui Jim sunglasses come with a microfiber cleaning cloth that can be used for this purpose. Rinse your frames under warm water. If there is any dust or debris that you want to remove, only use a mild soap. Rinse all the soap off of your frames. A build up of soap can make the frame look dull. When done, dry the frames by using a soft, clean cloth. There are several things that you should never do when cleaning your Maui Jim sunglasses. Only use a soft cloth to dry your sunglasses never a paper towel, since the paper towel contains wood fibers that can scratch the surface of your lenses. Tissues treated with lotion are also not recommended because they can leave a film. Since wiping your sunglasses with a soft cloth is recommended, only use one that is clean and has not been washed using a fabric softener. The fabric softener can leave a dulling film on your lenses. 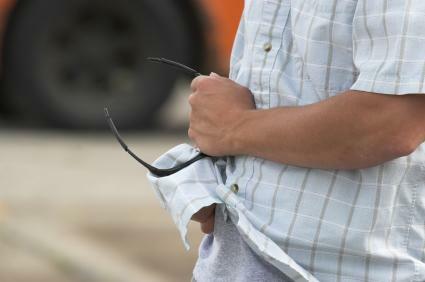 Cloths made from wool or denim can easily scratch sunglasses so avoid those at all costs. If your sunglasses require more than a quick rinse under water, only use a mild soap. Anything that is abrasive or harsh can scratch your lenses and permanently damage the frames. Frames can begin peeling if an abrasive is used to clean them. The anti-reflective coating on Maui Jim sunglass lenses can crack when exposed to extreme temperatures. Never leave your sunglasses sitting on your car's dashboard, out in the sun or in any area that is exposed to high heat. The coatings on the lenses and frames can become damaged when certain chemicals are applied. Anything such as window cleaner, hairspray or commercial cleaning products should be avoided. Try to keep your fingers off of the lens area. Fingers can leave smudges and oily marks. If you have a mark on the lens, never scratch at it with your fingernail to remove it. Use a cleaning solution made for your lenses and rub gently to avoid scratching the surface. You can purchase a Maui Jim Care Kit for around $10 online at Maui Jim's site. It contains a cleaning cloth and cleaning solution that can be used for cleaning your sunglasses. The items in the kit are specifically designed for Maui Jim sunglasses, so there is no chance of damaging or scratching your shades. Cleaning kits can also be found at most optical stores and retailers who specialize in sunglasses. When you are not wearing your sunglasses, always store them in a protective case to keep them in the best condition possible.